B2B sales has changed very little in more than 125 years, and yet buyers of technology products have dramatically changed the way they buy. If buyers change how they buy, then sellers must also change how they sell. Vendors must now transform their sales execution models to address the new buying journey. Many sales leaders seem unaware of the rapidly changing nature of buyer behaviour. Vendors are so focused on short term revenue results, and how they line up against their competitors, that they are unwittingly failing the first major test of business – understanding market trends and customer requirements. If buyers change how they buy, then sellers must also change how they sell. 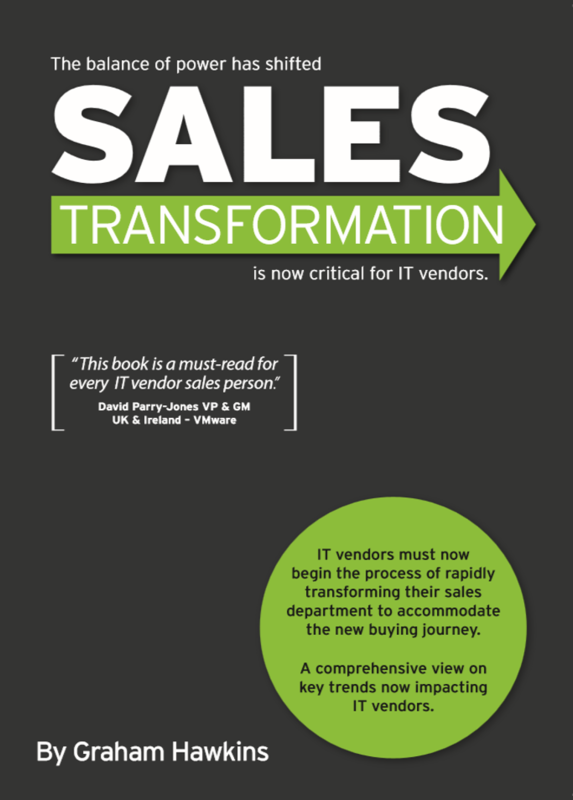 Change is no longer coming – it’s here, and Sales Transformation is the only answer. 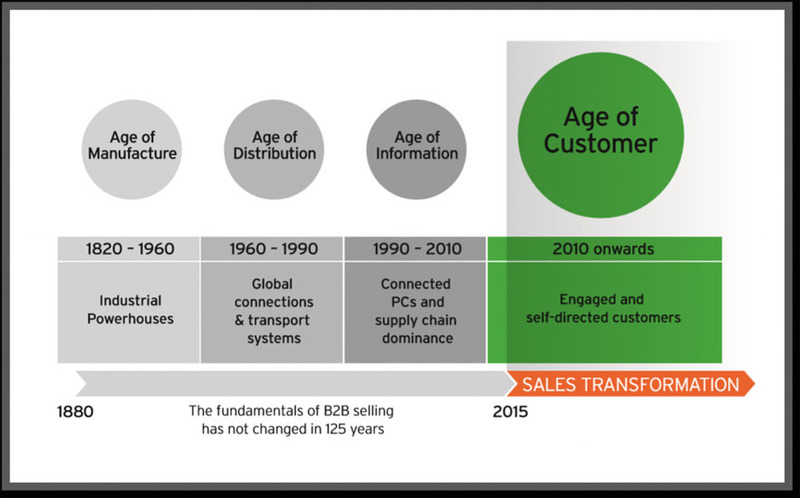 The fundamentals of B2B sales have not changed in 130 years, and yet buyers of technology products have dramatically changed the way they buy. It’s now clear that the big challenge for vendor sales leaders is how to bridge the chasm that now exists between the new buying journey and the now outdated B2B sales models. If your sales leaders are still driving the same tired old approach to sales force execution then your business is on a sure fire path to obscurity. The buying journey has changed. Customers now deliberately engage vendors very late in the buying journey which dramatically reduces the role of the vendor sales person. Being called into a sales opportunity late creates serious risk for vendors limiting their ability to influence the sale, therefore negatively impacting conversion rates. Vendor sales people are now wasting significant amounts of company resource when they fail to adequately qualify the customer’s new buying journey. As high tech markets mature and competition intensifies, many vendors are now so focused on how they line up against their competitors that these same vendors are unwittingly failing the first major test of business – understanding customer requirements, and keeping pace with the new buying journey. The power has now shifted to increasingly demanding customers, and as vendor rationalization continues to gain speed, the now common edict of doing “more business with less vendors” is a major game changer for vendor sales people. Read out latest thought leadership articles below. Why can’t sales people sell themselves? What exactly is Sales Enablement? First rule of sales? Make sure you ‘Differentiate’. This book provides important insights into current buyer behavior, evolving customer requirements and the factors that ultimately drive buyer behaviour, along with 10 Key Initiatives that will drive the transformation that is now required. CEOs whom want to protect financial results and ensure customer requirements are being met. Sales & Marketing executives whom wish to truly understand latest trends, customer requirements and the key external factors that are driving their business. Sales Directors and sales team leaders that are chasing increased sales productivity, conversion rates and reduced sales cycle times. Channel & Strategic Alliance Managers that seek the optimal route to market and coverage models. CFOs whom desire increased margins, more profit and lower costs per sale. 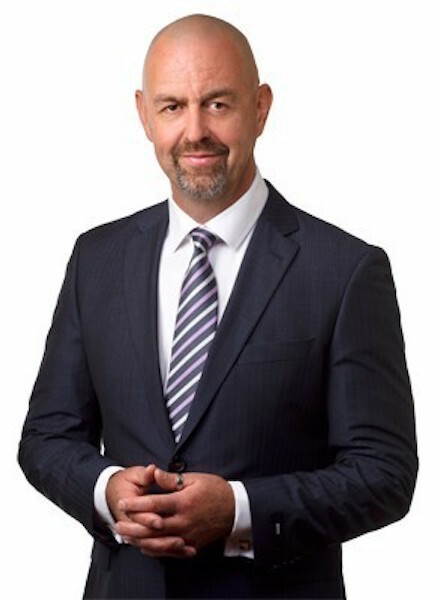 Anyone interested in understanding the key challenges facing businesses today – in particular, the successful execution of a contemporary sales strategy. “Technology vendors have had it too good for too long and the balance of power is shifting rapidly as we witness the rise of the customer-led economy. Adapting to this new customer-led environment is going to be a major challenge for vendor sales leaders, many of whom must now rapidly transform their sales models to accommodate these important changes in buyer behaviour.